Island Breze is our 3 bedroom, 3 bath vacation villa with a spectacular view in Coral Bay on the island of St. John in the US Virgin Islands. Three quarters of the island is preserved by the Virgin Islands National Park. Most of St. John remains unspoiled, unlike many islands in the Caribbean. Beaches are pristine and open to all. This is an ideal location to escape the stress of everyday life winter or summer with air and water temps in the 80's all year. Why risk a rained out vacation on Cape Cod or in Maine with water that is too cold to swim in? This is a comfortable home with arched windows, vaulted cypress ceilings, well equipped kitchen with dishwasher, washer & dryer, gas grill, cable TV, DVD, stereo, high speed wifi internet access and games. There are multiple covered and open decks with a spa for gathering and relaxing. The house is located at the end of a paved road in a very nice neighborhood with easy access to the beaches, shopping, hiking, or boating. Rent varies from $1645 to $2870 per week depending on time of year and number of bedrooms used. My name is Dennis Griffin. My wife Barbara and I have been married for 37 years and have one son, Evan. We live in New England and love going to Island Breeze in both the winter and summer. Barb has done a fantastic job of decorating our home on St John and both of us planted most of the trees and plants on the property. We first traveled to St. John after spending rainy vacations 2 years in a row on Cape Cod. We actually rented the house next to ours and contacted a realtor during our first stay. When we were notified that our home was available we immediately acted on it. We love St. John and Coral Bay is still what most of the Caribbean used to be like. We also love that the National Park has preserved so much of the island and that it will remain the way it is. Our home is one of 6 on a small private way with 3 families who are full time residents that we have known for many years. It is a private and friendly neighborhood. We have a gorgeous view and the beaches are a short drive away. St John fans of snorkeling, good eating & beach life. My husband and I have enjoyed this location without worry of being able to climb a really steep driveway. Island Breeze is the perfect place to stay if you like the quiet side of the island. It's very close to Coral Bay and all it's great bars and restaurants, but still quiet and peaceful. It's also conveniently situated to reach all the beaches without a long drive. Comfy beds, fully equipped kitchen, wifi, large covered deck, super-clean spa are just some of the many pluses. We also appreciated the beach chairs and umbrella that were furnished. We definitely plan on returning to this lovely home! Island Breeze is my first choice for a return trip! Immaculate, well equipped in every way - the kitchen, children's games, beach toys, and linens. Sitting on the deck off the living room with gentle breezes and wonderful views made it a true paradise after exploring the many beaches. At night sitting in the spa was the ultimate way to top off every spectacular day! Can't wait to return. Rates quoted are up to 4 people. Villa holds a maximum of 6. 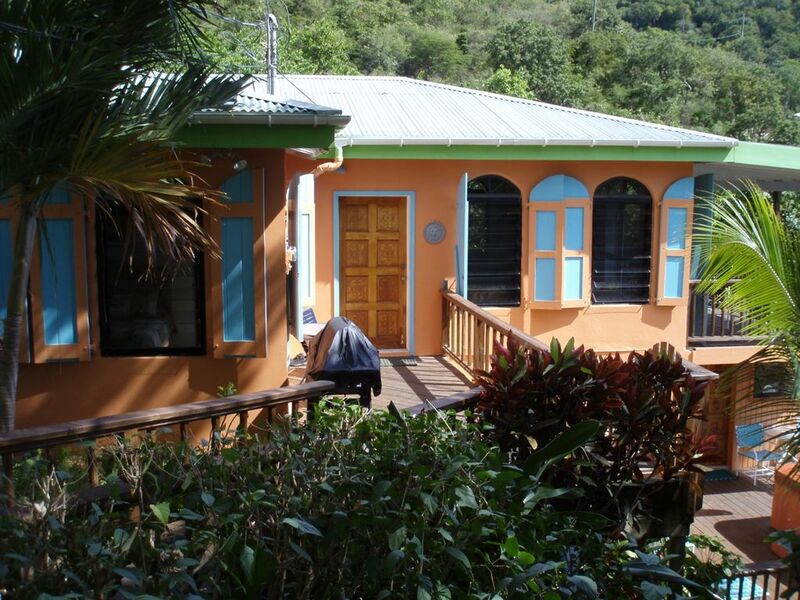 Additional rate of $10.00/night for 5 or 6 people in Summer and $60.00/night for 5 or 6 people in winter. Holiday rate is $3500.00 for up to 6 people during Christmas, New Year’s and President’s weeks. Damage insurance is non-refundable.